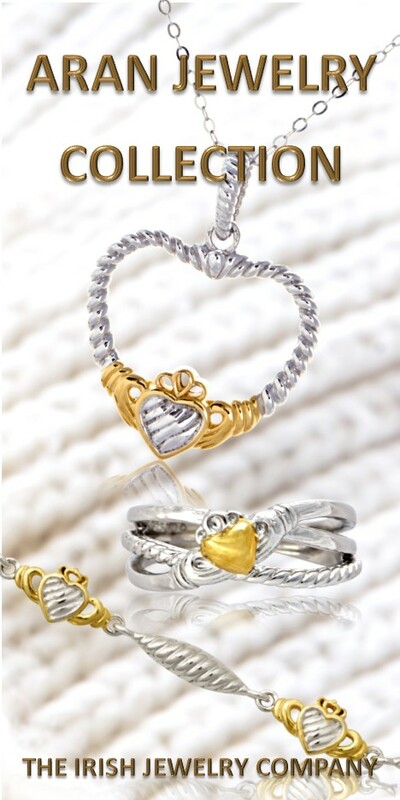 This Aran Claddagh Bracelet is finely crafted and accented with a warm yellow gold is a true Irish beauty. This designer claddagh bracelet with rope accent is inspired by the warmth of the Irish wool fibers twisted into the beautiful and strong yarn that is knitted into traditional Aran sweaters. The Aran sweater is a symbol of Irish heritage and traditional Irish customs. This claddagh bracelet is a symbol of friendship, love and loyalty. 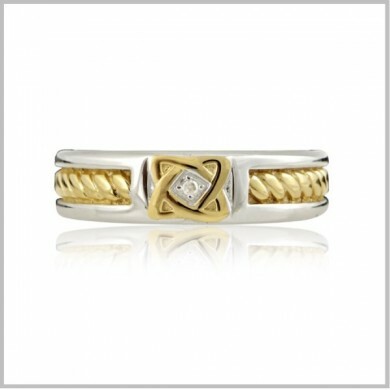 This Aran Claddagh Ring, finely crafted and accented with a yellow gold is a true Irish beauty. This designer claddagh rope ring is inspired by the warmth of the Irish wool fibers twisted into the beautiful and strong yarn that is knitted into traditional Aran sweaters. The Aran sweater is a symbol of Irish heritage and traditional Irish customs. The claddagh ring is a symbol of friendship, love and loyalty as inscribed inside the Aran Claddagh Ring. This Aran Irish Cross pendant, finely crafted and accented with a gold trinity knot is a true Irish beauty. This designer Celtic rope cross is inspired by the warmth of the Irish wool fibers twisted into the beautiful and strong yarn that is knitted into traditional Aran sweaters. The Aran sweater is a symbol of Irish heritage and traditional Irish craft. Our Oval Aran Trinity Pendant is symbolic of the rhythmic weaving and the knitting of wool. The oval rope accent is inspired by the warmth of the twisted wool fibers creating the beautiful and strong yarn knitted into traditional Aran sweaters. Combined with the tradition Celtic trinity knot the Aran sweater is a symbol of Irish heritage and Irish craft. Our Oval Aran Trinity Earrings are symbolic of the rhythmic weaving and the knitting of wool. The oval rope accent is inspired by the warmth of the twisted wool fibers creating the beautiful and strong yarn knitted into traditional Aran sweaters. Combined with the tradition Celtic trinity knot the Aran sweater is a symbol of Irish heritage and Irish craft. The Claddagh Story….. A short history of the Claddagh ring. Long ago a young man was captured and sold into slavery from the fishing village of Claddagh. Many years passed and he wondered if his true love would wait for him. Over the years he stole tiny bits of gold from his master to make her a ring. He fashioned a heart for love, a crown for loyalty and hands as a symbol of friendship. After many years he finally returned home to Claddagh. Upon his return and to his joy he discovered his true love had waited for him. He gave her the ring as a symbol of their love, loyalty and friendship forever known now as the Claddagh. 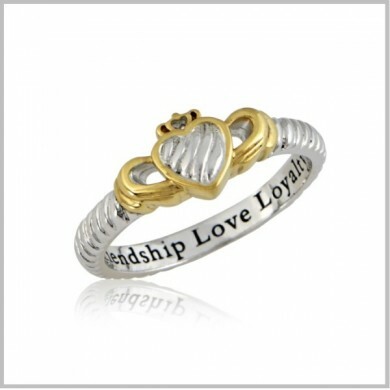 Do you have someone in your life to which you pledge your love, loyalty and friendship forever? The shamrock is the traditional symbol or Ireland. 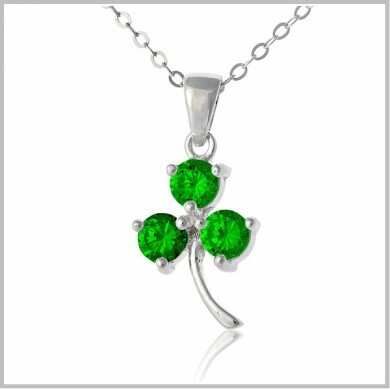 The shamrock forms a triad and the Celts believed three was a mystical number. Saint Patrick used the shamrock to explain the holy Trinity to the Celts. If good things come in threes then this silver 3-leafed shamrock pendant in beautiful emerald green is definitely a good thing. The Trinity knot also known as the triquetra is a continuous interweaving triple knot symbolism no beginning or ending. The Celts believe the number three was sacred such as the three stages of life, the three elements; earth, sky and sea and three stages of time being past present and future. Later the Christians adopted the symbol to represent the Holy Trinity. In modern times the Trinity knot is now interpreted as the Irish love knot. 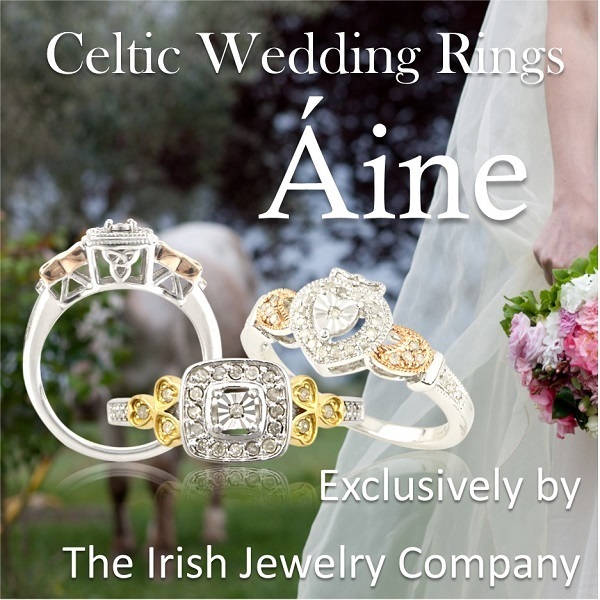 The Celtic Cross is viewed as a symbol of faith synonymous with the Irish culture. Legend also says St. Patrick, while preaching Christianity drew a cross through a Celtic circle symbolic of the moon Goddess. Hence the Celtic cross was born. Today the circle of the cross is viewed as a of God’s endless love. The sacred tree or Tree of Life was a central part of early Celtic spirituality. 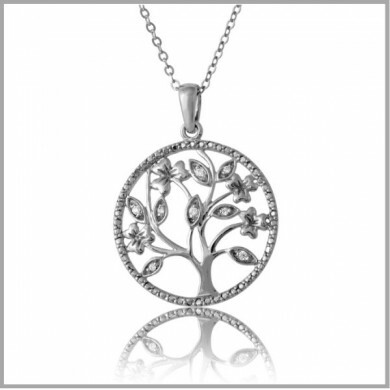 The sacred Tree of Life represented the fruitfulness of the earth, evoking spiritual growth and rebirth. Trees provided the Celts with a source for basic sustenance. Without trees, life for the Celts would have been difficult. The Celts believed the Tree of Life was rooted in the heart of the earth and that it drank the sacred waters of life. The Tree of Life stretched its branches into the heavens bridging earthly and celestial powers. Every Celtic tribe had its own sacred tree as a symbol of sovereignty, sacred wisdom and spiritual growth. The Claddagh Story….. A short history of the Claddagh ring. Long ago a young man was captured and sold into slavery from the fishing village of Claddagh. Many years passed and he wondered if his true love would wait for him. Over the years he stole tiny bits of gold from his master to make her a ring. He fashioned a heart for love, a crown for loyalty and hands as a symbol of friendship. After many years he finally returned home to Claddagh. Upon his return and to his joy he discovered his true love had waited for him. He gave her the ring as a symbol of their love, loyalty and friendship forever known now as the Claddagh. The Wild Irish Rose is a celebration of the sturdy, self-reliant and gorgeous Irish women past, present and future. Excerpt from the song My Wild Irish Rose written by Chauncey Olcott. The Irish harp, although not as renowned as the shamrock is the official emblem of Ireland. 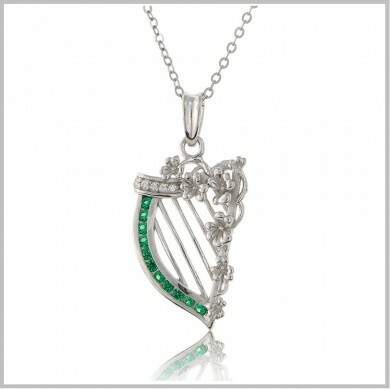 The Irish harps status as the official insignia of Ireland dates centuries and the elegant instrument’s history tells much about the history of the Emerald Isle. 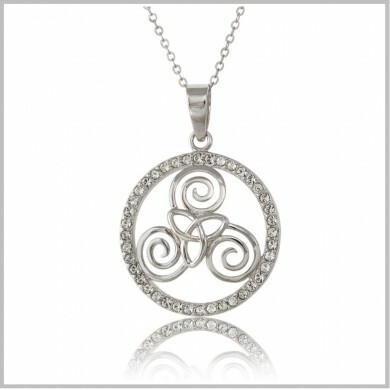 The Celtic Sisters Knot is a symbol of sisterhood and the strong, eternal bond we share with our sisters and friends. 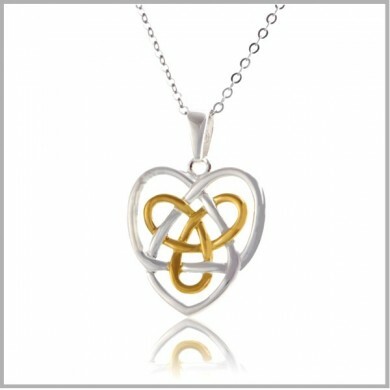 The intricate Celtic knot heart is an unbroken line symbolic of an everlasting love. 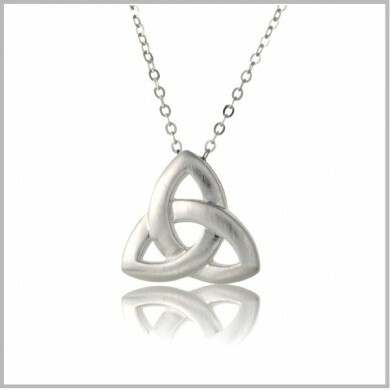 The stylized triquetra or triple spiral, woven within the Celtic knot heart symbolizes the three stages of woman. The three stages of woman are maid, mother and wise woman. Where are you and your sisters on the spiral of life? Celebrate the powerful, life long bond of friendship between women with our Sisters Knot. The triple spiral design of the triskele is associated with the Celts of Ireland and can be seen on the ancient site of Newgrange, in County Meath. Dating from 3200 BC, before the arrival of the Celts in Ireland, Newgrange contains carvings of the beautiful triple spiral design. 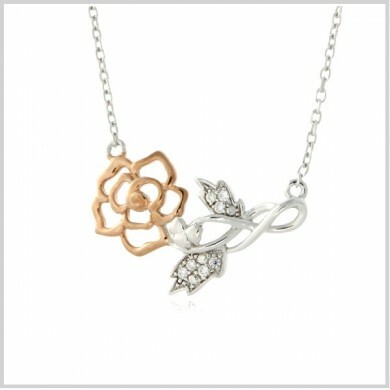 Today the triskele is still used in Irish craft as a symbol with enduring meaning and beauty. A Celtic knot is a stylized representation of an endless knot used for decoration by the Celts. There are eight basic types of knots. They have no religious or philosophical meaning other then representing the endless intricacy of humanity and nature. Spirals are the earliest decorative motif of the Celts and the first to disappear. Death and rebirth is the symbolism in the ever changing directional flow of the spiral.